Here is the third full length album from Oakland California's ABSTRACTER. After releasing « Tomb of Feathers » (2012), « Wound Empire » (2015) and a split with DARK CIRCLES, they are back with another opus proving they evolved in a good way and are better than ever. Who could say they were a noise duo in their first time and started as a studio only project ? ABSTRACTER stands for a reference in physics for disintegration! I love that band's name! Mixing Black Metal influenced drums, Sludgy, Crust, Doom and powerviolence, they obtained a perfect combination, a well balanced amalgam thats very interesting and quite excellent. Funeral doom lovers must have a listen. Where sometimes desolate ambiances, even well built, can fall in the dullness zone, they are not falling in that trap. They create variations that moves you even if you're stuck in great desolation and grief. 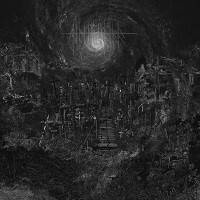 "Cinerous Incarnate" is also easy to listen for the bleakness lover. I had it in my car playing a couple times in its entirety and never got annoyed of it. When you can say that it shows that the album will be growing pretty well in the future. "Ashen Reign" is absolutely a strong composition among "Wing of Annihilation" and "Devouring the night". Alagna's vocals are nicely used through the entire tracks. Adam Gambel's drumming adds pretty much in the songs. His blackned technique fits perfectly for doing breaks into ambiences to send the listeners to new levels. The guitars creates wide landscapes and fills the most of the environment.Maybe the bass should have been more in the foreground sometimes , it melts in the mix most of the time but its not dramatic at all. The production is well done. The guys are experienced, they know what they want, they don't need any exploration. ABSTRACTER is mature and inspired. They get better and better in each album they release. "Cinereous Incarnate" is one of my favorite 2018 funeral doom album. They deserve a lot of exposure and recognition. This album is a blast, slowly consuming you mentally, an accomplished display of creative mind blowing darkness caressing your soul while pushing you head first down the cliffs of desperation! Evolving into the twisted, wicked, abomination that we're pushed through. I…WANT…MORE.